KUWAIT National Petroleum Co (KNPC) is investing $35 billion in projects to modernise the country’s Mina Abdullah and Mina Al Ahmadi refineries, as well as to construct the region’s largest refinery, the Al Zour plant. 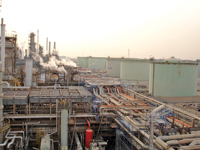 The Clean Fuels Project (CFP) and the New Refinery Project (NRP) are ambitious plans to overhaul Kuwait’s refining sector. Once completed, these projects will not only represent one of the largest undertakings in Kuwait’s history, but they will also reshape its refining sector. Despite its size, Kuwait has the third-largest refining capacity in the Middle East. At present, capacity is 936 thousand barrels per day (Mbpd). This production capacity is derived from three refinery complexes – Mina Abdullah, 270 Mbpd, Mina Al Ahmadi, 466 Mbpd and Shuaiba, 200 Mbpd. The three refineries are located along the coastal zone south of Kuwait City and approximately 6 miles apart. All are owned and operated by KNPC. After the completion of the CFP and NRP projects, total domestic refining capacity will increase to 1.4 million barrels per day (Mmbpd). Kuwait consumes only a small portion of its total crude production. According to the US Energy Information Administration (EIA), Kuwait’s oil use reached only 406 Mbpd in 2012, leaving the vast majority of its production available for export. This excess supply has propelled Kuwait to become the third-largest exporter of liquids among Opec producers, behind Saudi Arabia and Iran, and one of the top 10 oil exporters worldwide. Domestic consumption has been rising steadily, however, due to increased petroleum-fired electricity generation. Rising demand and a failing infrastructure have prompted Kuwait to develop the CFP and NRP projects. The $17 billion CFP is designed to upgrade and integrate the Mina Abdulla and Mina Al Ahmadi refineries. The 200-Mbpd Shuaiba complex will be shut down, as a revamp of the facility was deemed uneconomical. The Mina Al Ahmadi refinery’s capacity will decrease to 346 Mbpd, and Mina Abdullah’s throughput will increase to 454 Mbpd. The newly integrated refineries will act as a single merchant refining complex, boosting domestic capacity from 736 Mbpd to 800 Mbpd. With the addition of the Al-Zour refinery, domestic refining capacity will reach 1.4 Mmbpd by 2018. The CFP objectives include meeting year 2020 market demand and specifications for low-sulphur transport fuels, concentrating refining capacities at Mina Abdullah and Mina Al Ahmadi, improving the operating performances and energy efficiencies of the refineries, reducing carbon dioxide emissions, optimising KNPC hydrocarbon products output between the refineries and closing the Shuaiba refinery, and potentially integrate some offsite facilities (storage, blending and shipping/logistics facilities) with Mina Abdullah and Mina Al Ahmadi operations. The CFP includes the installation of 39 units, the revamp of seven units and the closure of seven units. Once completed, the reconfigured and integrated Mina Abdullah and Mina Al Ahmadi refineries will decrease the sulphur in gasoline production from 500 ppm to less than 10 ppm. Benzene and aromatics concentration will also decrease. Bunker fuel oil sulphur content will decrease from 4.5 ppm to 1 ppm, and maximum sulphur content of full-range naphtha will drop from 700 ppm to 500 ppm. Although KNPC has moved into engineering, procurement and construction (EPC) tendering for portions of the CFP, this project was very nearly cancelled. Initially planned 10 years ago, the project suffered a series of delays due to political conflicts. The two projects have been repeatedly delayed by political disputes between Kuwait’s parliament and the government. Problems have stemmed from both entities being divided over the projects’ plans, as well as from accusations that contracts were not being awarded to the lowest bidder. The projects were revived in 2012 with the award of the project management consultancy (PMC) contract to Foster Wheeler (FW). FW’s scope of work includes the provision of PMC services during the tendering phase for the main EPC contracts, as well as management of the EPC contractors through to the completion of performance testing. Also, AMEC was awarded a $260 million project engineering and management services contract. The five-year call-off contract has an optional one-year extension. AMEC will be responsible for a range of engineering and management services, including feasibility studies, front-end engineering design (Feed), PMC services and the training of Kuwaiti engineers. The contract also involves providing studies and Feed to KNPC’s local marketing and projects department for its domestic petroleum storage and transportation facilities. In April 2013, KNPC issued the EPC tender for the CFP. The three main packages include revamp and upgrade of the Mina Al Ahmadi refinery, revamp, upgrade and expansion of the Mina Abdullah plant, as well as the shutdown and dismantling of the Shuaiba refinery and expansion of the Mina Al Ahmadi refinery’s facilities and utilities. Seven firms have been prequalified to bid for the project. The companies include Chiyoda, Fluor, JGC, KBR, Petrofac, Saipem and Tecnicas Reunidas. The technical and commercial proposals deadline was set for November 2013, and EPC contracts are expected to be awarded in 2014. Completion of the CFP is scheduled for early 2018. To complement the CFP, KNPC will construct the largest refining complex in the Middle East. The 615-mbpd Al Zour refinery will supply power generation plants in Kuwait with environmentally friendly fuel and provide alternatives to gas imports and heavy fuel use. Kuwait also hopes the $14.5 billion project will open its high-quality petroleum products to new markets across the globe and enhance its competiveness within those markets. Additional objectives include increasing domestic refining capacity to 1.4 Mmbpd, significantly improving emission levels in the country, producing 225 Mbpd of low-sulphur fuel oil to meet growing demand for low-sulphur fuel oil needed for power generation, producing 340 Mbpd of export products, including ultra-low-sulphur (ULS) diesel, ULS kerosene, petrochemical naphtha and liquid petroleum gas and contributing to economic growth and development and job creation opportunities for Kuwaiti nationals. Originally planned a decade ago, the NRP has been postponed a number of times. As with the CFP, political conflict between the Kuwaiti parliament and government is to blame for the delays. Allegations of corruption by the nation’s cabinet and national assembly suspended contract awards. In 2008, contracts were given to South Korea’s GS Engineering & Construction and Japan’s JGC Corp; however, the cabinet halted the project on the grounds that oil prices were too low to finance the project. KNPC received final approval to proceed with the project in 2012. In December of that year, AMEC was awarded a $528 million PMC contract. One year later, in December 2013, Honeywell was awarded a contract to serve as the main automation contractor for the refinery. Honeywell will supply its Experion Process Knowledge System as the main control system, as well as integrate all process automation systems throughout the site.